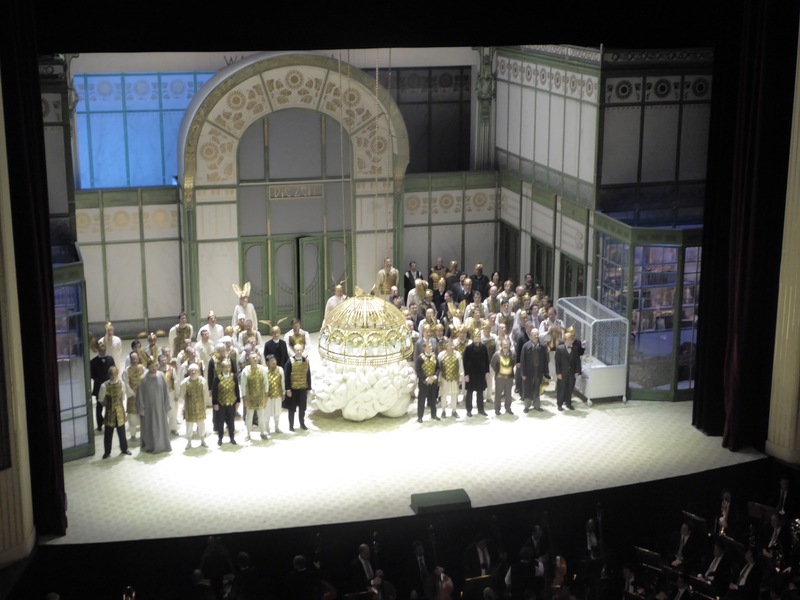 The plan to catch a new production by Alvis Hermanis in Vienna emerged as soon as the opera house announced 2016/2017 season, and a possibility to combine Easter break with a trip to Vienna proposed enticing opportunity. The symbolism of seeing Parsifal on Easter Sunday came only when the ticket was secured and travel plans started to materialise. Probably I am one of those Latvians avidly following every new undertaking by Hermanis in the opera world – at least, according to my own observations, Latvian language speakers are in abundance at the each production I have visited, either in Salzburg, Milan, Berlin or Vienna. This speaks volumes about Latvians as a small nation, being a bit obsessed by fellow citizen’s achievements in the big world – being it contemporaries, like Hermanis, or vaguely related historic figures, like Rothko. If there is one characteristic of Hermanis productions that is consistent it is extreme attention to visuality. The sets are meticulously planned and executed, the stage receives extreme makeover aligned visual perception of the director. Video projections and lights are strong allies in his visual storytelling, and this never lets you down. There is also another characteristic I have noticed over time and see it as a consistent directorial approach: based on his theatrical experience, mostly working with Jaunais Rigas teatris, which has an exceptional ensemble of creative and self-sufficient actors, Hermanis probably expects the same dedication and ability from his singing actors in the opera. In some cases, like in Il Trovatore with Netrebko and Domingo, this works out perfectly well, in most cases this creates a bit static performance with convenient singing positions for main protagonists and very limited acting and interactions. Unfortunately, “Parsifal” falls into latter, and as a typical example, I can mention Act 2 duet between Kundry and Parsifal when each of protagonists deliver their part into audience rather than to each other. Hermanis might become extraordinary opera director if he would focus more towards direction of main protagonists as he does for the sets and visual details. 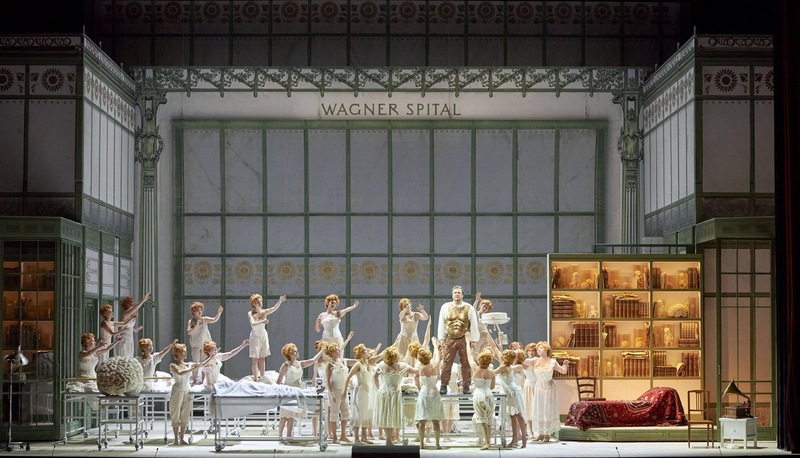 We are invited to join Wagner Spital, where all action of the opera is staged. This opens a wide space for contemplation and reflection in the context of the libretto. Gurnemantz (excellently performed by Kwangchul Youn ) runs the sanctuary with a lot of people with wounds in their heads, either obvious and hidden. The most prominent one here is Amfortas (Gerald Finley), who is surrounded by the knights of the Holy Grail. They all rely on a miracle – an innocent fool appearing and saving them all. Then there is Kundry (Nina Stemme), the epitome of all evil and sinful on the earth – she is condemned for eternity and also her redemption is in the hands of the innocent fool. The evil Klingsor (Jochen Schmeckenbecher) appears as a Freudian therapist with superpowers, which are useless when confronted by purity and conviction. I have never been Wagner aficionado, nevertheless, on my opera exploration journey I am gradually making small and consistent steps to come closer to understanding and appreciation of his heritage. The music is unquestionably genius, while the librettos and the philosophy or moral values underneath are slowing down my approach. The same refers to “Parsifal” – the legend itself does not constitute any issue while interpretations do. Supremacy as the concept doesn’t appeal much, as we have seen so many disastrous examples from its misinterpretation. Savior is a key to redemption and firstly each and everyone of us has to find our own way to resurrection either through innocence or enlightenment, finding his inner Parsifal. Even if I am a big fan of visual storytelling by Hermanis, the cast made the performance memorable. The ensemble produced consistent vocal performance, supporting each other and letting main protagonists to shine in their particular moments. Nina Stemme was excellent as Kundry, and it is difficult to believe that it has been her role debut. Her heroine has a multitude of incarnations and widely varying demands on both vocal and acting fronts, and she conquered them all impeccably. Her transformation from wild and incoherent wandered in Act 1 to glamorous seductress through electrocution (smart directorial touch) in Act 2 where her line dominates and we can get carried away in her nuanced and absorbing delivery of the role, then turning into redeemed sinner in Act 3 salvaged by Parsifal. Surprisingly, she survives the transformation, I believe this is contrary to Wagner’s original intent where Kundry supposedly falls lifeless. Christopher Ventris as Parsifal was a new discovery for me, he is experienced Wagnerian tenor and has been performing extensively, including Bayreuth. His timbre is soft and clear, his vocal delivery expresses emotional nuances and soars over the orchestra with an ease. Kwangchul Youn as Gurnemantz was a great surprise and a new discovery, his pleasant tone and velvety bass fit the role perfectly. Gerald Finley as Amfortas was delivering good performance, he created encompassing portrayal of wounded and suffering warrior, who overcomes pain to help the community. The production reminds beautiful picture book. Some innovative findings – mental hospital, the revival of Kundry in Act 2 with electrodes, sets and videos providing good illustration to the story, which is told very close to the libretto. Symbolism and ideas in abundance – from Holy Grail as sparkling chalice to human brain and its hidden superpower and our ability to recover it, – for many people all these layers might seem too much for absorption. Semyon Bychkov brought the orchestra together as a uniform organism, the sound flew through the house as from one single instrument. The support for the singers was extraordinary, even when noticing that orchestra is covering, he immediately pulled back letting human voice to soar above. There were a few almost transcendental moments – Communion music by the chorus from above, and the bells reverberating through the auditorium with such a force and depth it touched the depth of the heart. This is certainly a performance worth to see, the cast has brought the story alive, and despite some minor shortcomings, there is ample material to absorb and contemplate, and to start planning for next Parsifal during Easter of 2018 – a lot of enticing choices are available! Previous Post: The tale of two queens in the eternal city. Maria Stuarda, Donizetti, Rome. 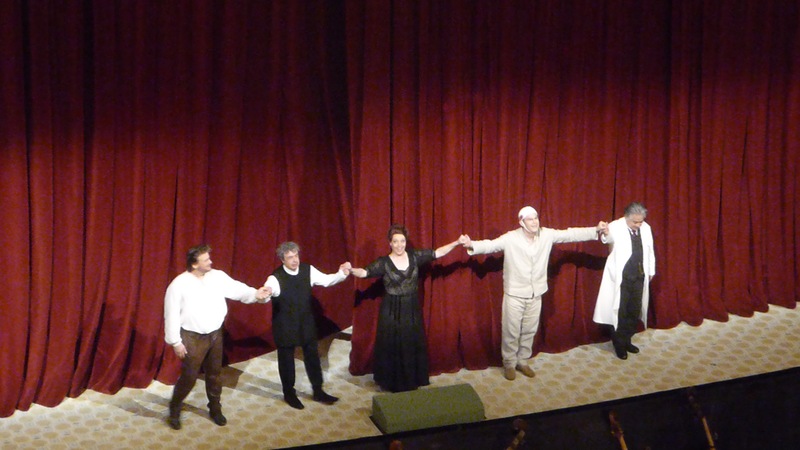 I find it difficult to fully embrace Parsifal but admire these singers, team very much! Looking forward to the broadcast.